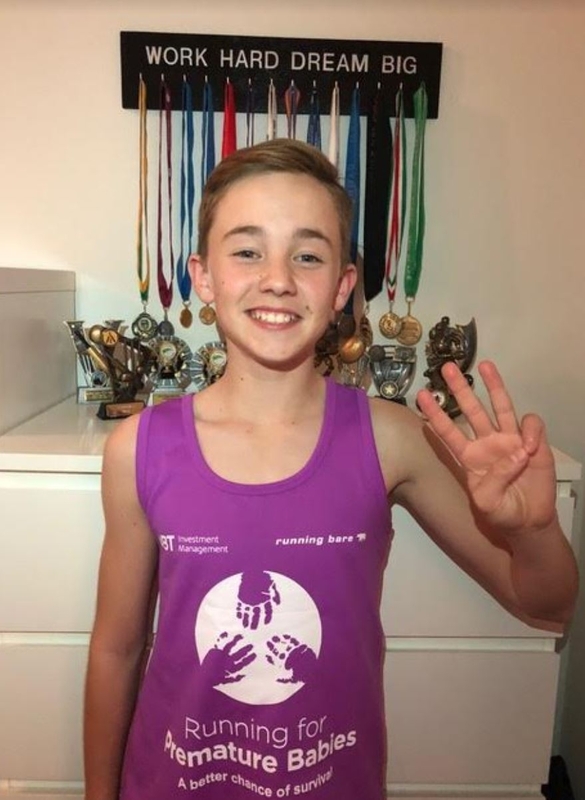 Noah Sullivan is turning 12 on 31 July and twelve days later he’ll be running the City2Surf with his mum Belinda. Noah will have extra motivation for getting up heartbreak hill and around the 14km to Bondi, as he’ll be running with a photo of another little boy pinned to his shirt and three sets of tiny handprints on his back. This little boy is Henry Smith and the handprints belong to Henry and his triplets brothers Jasper and Evan. Noah Sullivan and Henry Smith were both born at the Royal Hospital for Women on 31 July 2006. While Belinda was in labour with Noah and preparing to welcome her baby into the world, she became aware that a very different story was unfolding in the room next door. Sophie Smith was in labour too, but with triplets, and tragically only 21 weeks into her pregnancy. A few hours later, when enjoying the magical first moments with her healthy newborn baby boy, Belinda knew that next door another baby boy called Henry had also been born. At 21 weeks, too early for medical intervention to help, and weighing just 450g, tiny Henry lived for only one hour in his mother’s arms. Belinda never forgot how blessed they felt that day and the helplessness of knowing that another family’s experience was so different to theirs. Every year on the eve of Noah’s birthday when tucking her little boy into bed, Belinda has always told Noah the story of his birth. It’s a happy story but it also always includes the story of Henry Smith, the little boy who was born and died next door. That’s how Noah has grown up knowing about Henry, who he likes to think would have been his friend, and that’s why Noah has chosen to run the City2Surf to raise funds for the Running for Premature Babies Foundation, the charity founded in memory of Henry and his triplet brothers, to give premature babies a better chance of survival.